The History Group of the Oxton Society meets regularly to discuss local history and plan a range of activities, including Heritage Walks of the Oxton area. 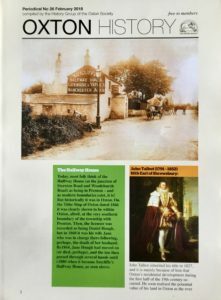 The Society’s History Group publishes newly researched information on Oxton in the History Periodical as a supplement to the Oxton Society Newsletter 4 times per year. Click here for a sample. Back numbers may be purchased for £1 from Oxton Village Books. If your ancestors came from the Oxton area and you would like some assistance with your family history research, the History Group will be happy to help if we can. We helped Rosanne Rappazini from Washington State, USA, to trace her Oxton family and put her in touch with a cousin in the area – read her story.